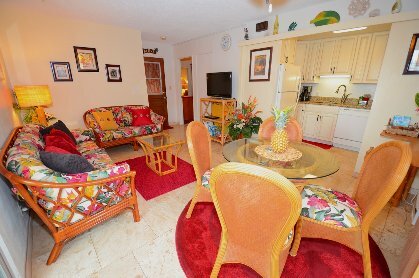 This great Maui Boutique Condo is Located on the longest beach of Kihei, Maui in Hawaii on Sugar Beach, offers ocean view, beach, snorkeling, swimming pool, air conditioning, nearby shopping. 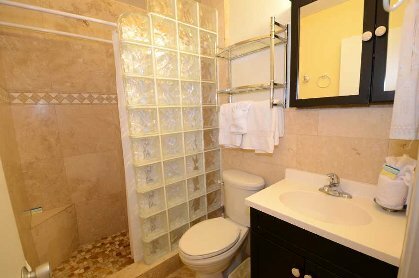 This condo was totally renovated, with new kitchen and travertine bath with glass block, Travertine tile throughout and kitchen has solid granite counters and all new appliances, newer furniture and memory foam mattress for an ultimate sleep experience. 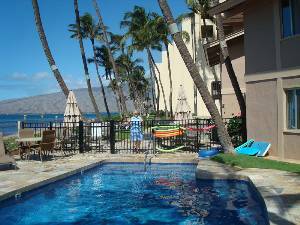 Rates are much lower than comparable Maui condos in the area. Most visitors to our condo return repeatedly. 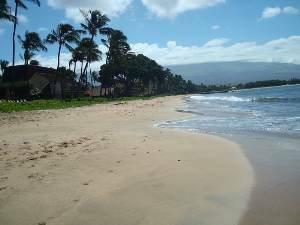 Our lovely 1 bedroom 1 bath, and our 3 bd 2bth Condos are on the "sunny south shore" of Maui. 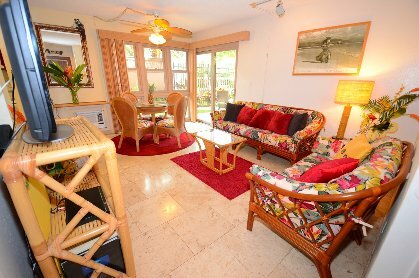 The condos are fully furnished and completely equipped to make your vacation "No Ka Oi" (the best!). 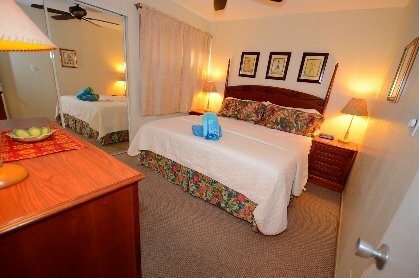 The 1 bedroom unit accommodates 3 people and the 3 bedroom unit accommodates 6 persons. 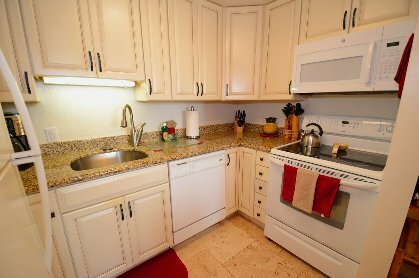 The units feature free high speed internet, complete kitchen, fully equipped, microwave oven, color TV, Dvd/Vhs player, security safe, all linens, beach towels. Washers and dryers are available on each floor. 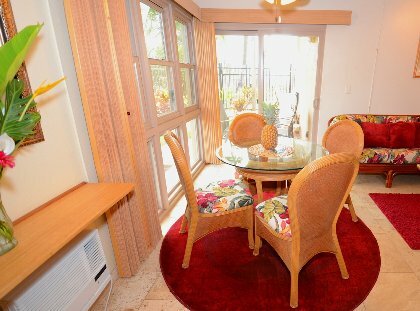 Amenities on the property include a pool, BBQ, ocean sunsets and even whale watching in season from the lanai. We loved this condo. It was right on the ocean and close to so many restaurants and shops. We had a great time. The rooms are spacious and clean. Everything was well stocked in the kitchen and we were very comfortable. There was plenty of space for all of us in the three bedrooms. The grounds were well maintained and there was always parking available. The pool was lovely and so were the beaches. Although the beaches were closed one day because of sharks. We loved the view from the balcony. We saw dolphins one morning and we saw whales a few times in the distance. The sunset views from the balcony of the condo or the terrace by the pool can't be beat! They were amazing!!! We went to Lahaina a couple of times where we enjoyed the Atlantis sub and some shopping and the Royal Lahaina Luau. We also drove the Road to Hana. We stopped at a little stand at a Shell Station and bought a CD to listen to as we drove. It made the drive really interesting. Maui is great and I highly recommend visiting there and this condo was the perfect place to stay. Deposit: Reservations will be confirmed upon receipt of deposit payment equal to 25% of the gross rental fee or $450; whichever is greater. Reservations are subject to a nonrefundable $40 booking fee. Payment of balance in full due 60 days prior to arrival for Summer season rentals or 90 days prior to arrival for Winter season rentals Payments may be made by Visa and MasterCard.